We have seen that after watching a super comedy trailer of Humshakals that makes one laugh on their own have increased than 2 Lac views on YouTube & fans getting crazy, this film has reached its 5th day on the box office now. Humshakals is the latest comedy film that hit the big screen last Friday and was one of the popular and awaited movies of this year 2014. But on the contrary to the pre release excitement and promotion, the film has not made such a fantastic performance till now. Among all the days, Sunday had ended up being the highest grossing day for this film. As now its weekday’s time so the film is suffering low occupancy and public response other than normal weekend days. The film made good start and is doing decent but not tremendous or stupendous. It can be taken as a good entertainer and comedy option but not as a blockbuster or super hit material. Fifth day came with a normal profit for the film. Humshakals has many plus points in its favor as it has great star cast of actors like Saif Ali Khan, Riteish Deshmukh, Ram Kapoor, Bipasha Basu and Tamannaah Bhatia, Esha Gupta. Also the film makers are very popular and experienced so on the whole the film has much in it keeping the story aside. On its first Tuesday the film made a total income of 4.25 Crores. Once again Said Khan has shown the audience another specimen of his illogical films but good with humor. Audience is now habitual of his concepts and thus they are still enjoying Humshakals for its comedy factor and star power. 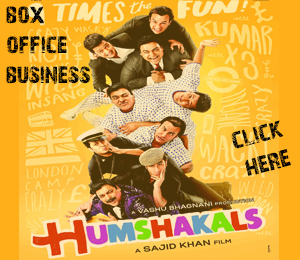 Here are many days to come in account of Humshakals so just stay connected with us to see its business report in the upcoming days.